What does it mean to find a gene or set of genes that are associated with ADHD, schizophrenia, or autism? Could we eradicate such diseases from our species through gene therapy? Is it possible to eradicate from our genome the genetic material that predisposes us to be too aggressive, too shy, less intelligent, or not active enough? Who has the political power and/or moral authority to make these decisions? The premise of Nature and Nurture is that the complexity of the transactions between nature and nurture--between genes and the environment from the cellular to the cultural level--make these questions incredibly complex and in need of careful attention by educators, scientists, the public, and policymakers. A product of the conference held at Brown University in 2001, this book suggests that genes and environments work together interactively in a complex and closely intertwined fashion. The contributors to this book--biologists, psychologists, psychiatrists, and economists--present knowledge that enables research and application to transcend the traditional question of whatever variance or significance is attributed to genetics versus environment in the development of a particular behavioral trait. This book presents a variety of views on the current status of knowledge about the ways in which dynamic, developmental, mutually interactive systems in the genetic and environmental domains operate. The chapters represent contributions from different perspectives. Contents: S.E. Hyman, Foreword. Preface. C. García Coll, E.L. Bearer, R.M. 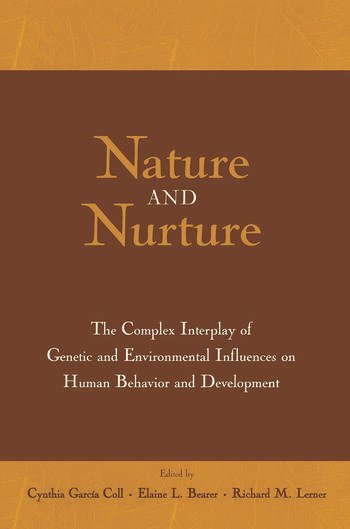 Lerner, Introduction: Nature and Nurture in Human Behavior and Development: A View of the Issues. R.M. Lerner, Genes and the Promotion of Positive Human Development: Hereditarian Versus Developmental Systems Perspectives. S.J. Suomi, How Gene-Environment Interactions Influence Emotional Development in Rhesus Monkeys. M.B. Spencer, V. Harpalani, Nature, Nurture, and the Question of "How? ": A Phenomenological Variant of Ecological Systems Theory. A. Fausto-Sterling, Commentary. G. Gottlieb, Normally Occurring Environmental and Behavioral Influences on Gene Activity: From Central Dogma to Probabilistic Epigenesis. R. Rende, Beyond Heritability: Biological Process in Social Context. J. Hirsch, Uniqueness, Diversity, Similarity, Repeatability, and Heritability. L. Braun, Commentary. W.T. Dickens, J.L. Cohen, Instinct and Choice: A Framework for Analysis. E.L. Bearer, Behavior as Influence and Result of the Genetic Program: Non-kin Rejection, Ethnic Conflict, and Issues in Global Health Care. W.F. Overton, Embodied Development: Ending the Nativism-Empiricism Debate. C. García Coll, E.L. Bearer, R.M. Lerner, Conclusions: Beyond Nature Versus Nurture to More Complex, Relational, and Dynamic Developmental Systems. "The scholarship in this volume provides scientific legitimization for innovative, relational approaches to the study of nature and nurture and its applications to policy and social programs....This volume is appropriate for use in upper-level undergraduate and graduate courses in human biology, human development, and developmental psychology. Nature and Nurture will also be of interest to scholars and professionals in a variety of academic disciplines." "The premise of Nature and Nurture is that the complexity of the transactions between nature and nurture-between genes and the environment from the cellular to the cultural level-make these questions incredibly complex and in need of careful attention by educators, scientists, the public, and policymakers....The contributors to the book-biologists, psychologists, psychiatrists, and economists-present knowledge that enables research and application to transcend the traditional question of whatever variance or significance is attributed to genetics versus environment in the development of a particular behavioral trait. This book presents a variety of views on the current status of knowledge about the ways in which dynamic, developmental, mutually interactive systems in the genetic and environmental domains operate." "The contributors to this book-biologists, psychologists, psychiatrists, and economists-present knowledge that enables research and application to transcend the traditional question of whatever variance or significance is attributed to genetics versus environment in the development of a particular behavioral trait. This book presents a variety of views on the current status of knowledge about the ways in which dynamic, developmental, mutually interactive systems in the genetic and environmental domains operate." "This very comprehensive text achieves its stated purpose by providing a series of scholarly papers representing perspectives supporting the main premise that the nature vs. nurture controversy is simplistic and not productive. The strengths of the book include the very high level and specific information on a range of related topics in this field. The book is carefully indexed, serving as a good reference source. The issues proposed are complex and provocative, and as such demand the consideration of health care providers."